On March 25, 2008 University of Connecticut President, Michael Hogan, signed the American College & University Presidents Climate Commitment (PCC) promising that the university would aim for carbon neutrality by 2050. This means that the university would have to reduce greenhouse gas emissions, particularly carbon dioxide, through new projects and sustainable initiatives. Since the signing of this agreement, UConn has been retro-commissioning and re-lamping many large buildings to save on energy costs and negate greenhouse gas emissions. The university has also implemented an energy efficient fuel cell on the depot campus. So have we made progress? UConn has reduced its primary CO2 emissions by 4,802 tons per year since 2011 (more than 4%). This is a great decrease considering the increased student population, building space and tough winters (requiring a lot of energy consumption for heating) which Storrs has experienced over the past few years. It should also be noted that our emissions tracking technology and behavior has been improved over the past few years. We expect to see further drops in greenhouse gas emissions each year. To put our expected greenhouse gas emissions decreases into perspective, keep in mind that the retro-commissioning and re-lamping projects from the past few years have expected carbon dioxide offsets of 16,000 tons per year (This would cut out main body of emissions by more than 10%). Although we didn’t see the expected decrease in 2013 due to some of the above factors, we believe that the general trend will continue to be downward. UConn uses the University of New Hampshire’s Campus Carbon Calculator to calculate emissions. 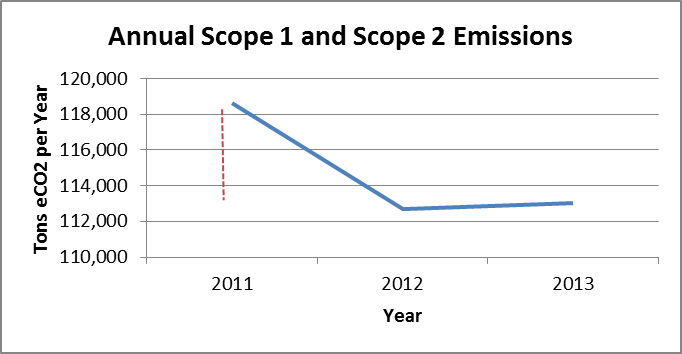 Scope 1 refers to direct emissions from campus activity. Scope 2 refers to indirect emissions from purchasing and related activities. The greenhouse gas inventory takes a very long time to complete because we have to contact various people from many different departments for emissions data. We put all of this data into common terms, verify it, and enter it into a large greenhouse gas calculator so that we can analyze our results. Let’s just say that we’re happy to be finished with this year’s greenhouse gas inventory, for now. 1 down, 1 to go: Women’s Basketball Green Game Day was a success! Thanks to everyone who came out to watch the women’s basketball team beat SMU 102-41 for their 30th consecutive win. By coming to this game, viewers supported the school’s athletics and recycling initiatives. 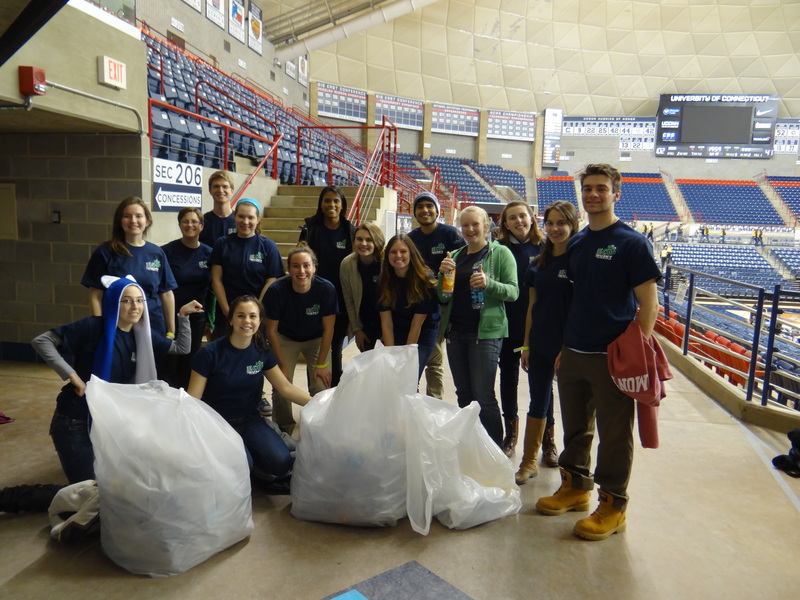 Volunteers from EcoHusky and student interns from the Office of Environmental Policy collected the bottles left in the stands, and recycled almost 300 bottles and would have had to recycle more if it weren’t for the help of recycle-savy fans. 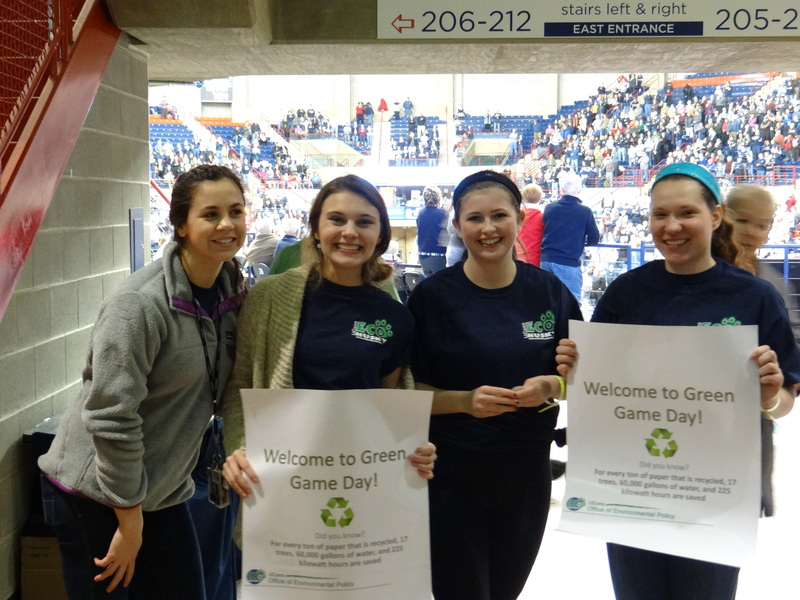 Volunteers from EcoHusky at Avery Point also came out to support Green Game Day and the women’s basketball team; it was hard to miss them as they handed out tattoos and flyers at the entrances to Gampel Pavilion. 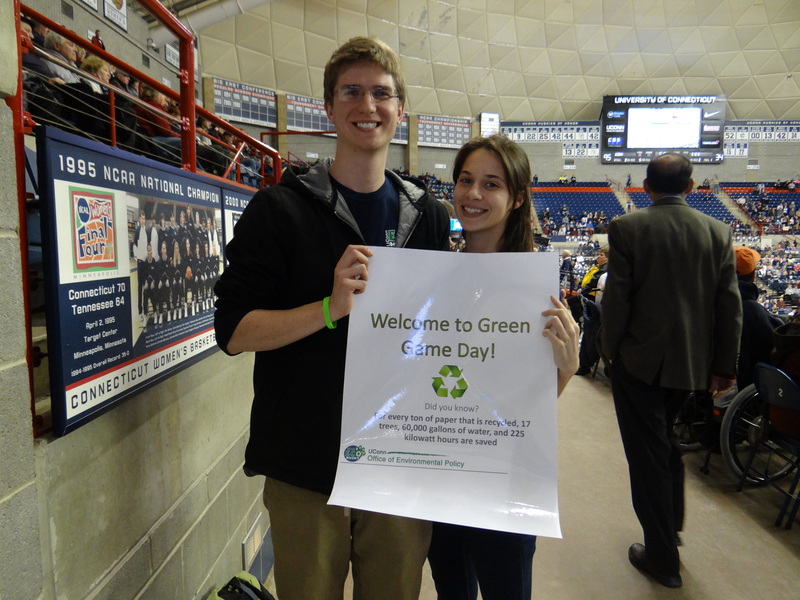 Stay tuned for Men’s Basketball Green Game Day on February 22nd as UConn plays SMU!